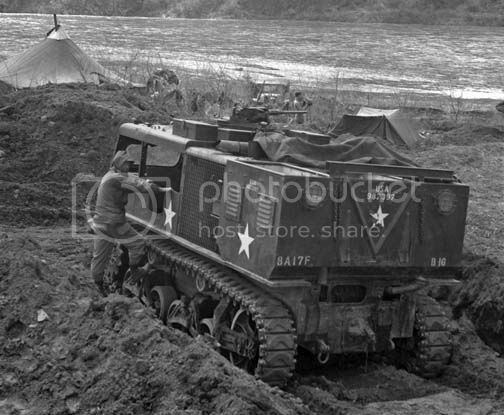 The M4 was based on the chassis and drive train of the obsolescent M2 Light Tank. This common practice of re-using old vehicles simplified design, allowed for easy production, and made maintenance in the field easier. The M4 was manufactured by Allis-Chalmers of Milwaukee, starting in 1942 and was in U.S. military service until approximately 1960. 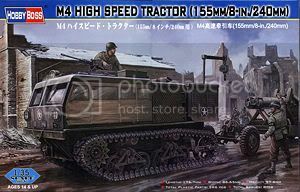 The M4 version I will be building will be the howitzer version with the ammunition box designed to carry 8 inch howitzer ammunition. 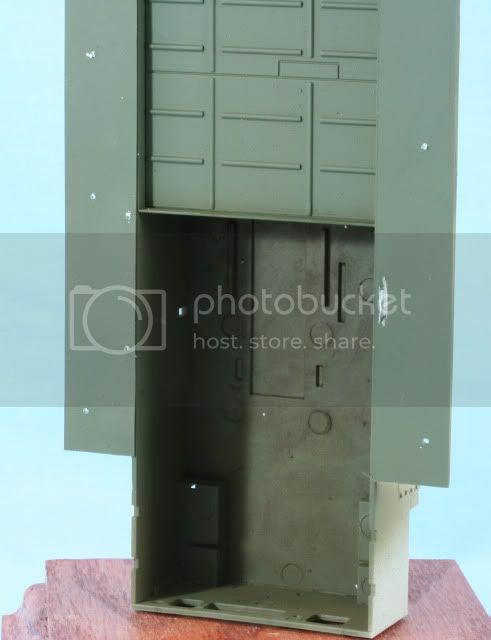 I will also be adding the Eduard PE sets 36072 which is the outside details and 36073 which is the cab doors. 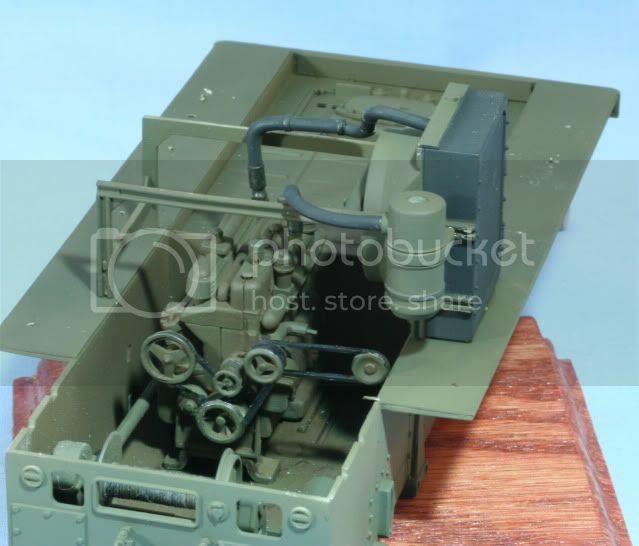 I will also replace the M2 MG with a Tasca MG.
By the start of building this kit I quickly realized it will also require, liquid putty, Mr. Surfacer, .010, .020 & .040 styrene sheet and lots of sandpaper as you will see below. Because of the nature of this kit and how it is assembled, the instructions are for guidance but it has to be assembled and painted in small sub assemblies otherwise it will be almost impossible to paint all the details. First I began with lower hull assembly. 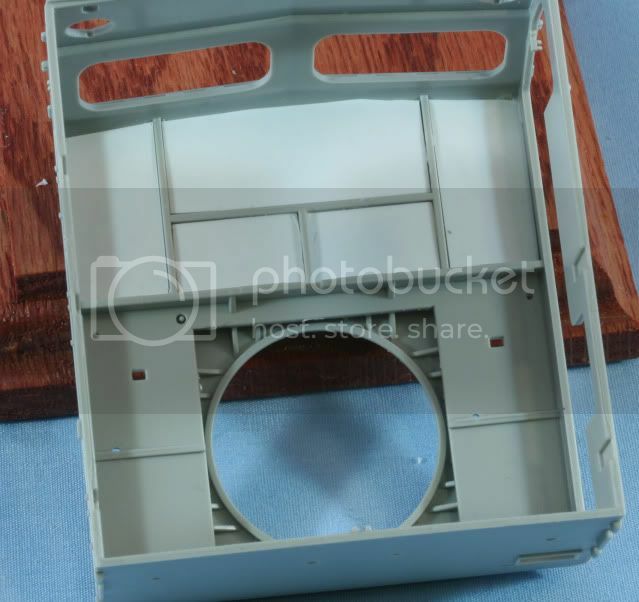 This included the hull front plate, rear plate and interior floor plate. The side panels which cover the tracks were completely covered with large deep pin marks, about 6 on each side. After trying to fill and sand, I went the route of using .010 styrene sheet and just covering the marks. I then primed the top half with Vallejo OD primer and painted with Poly Scale Olive Drab 505 370. 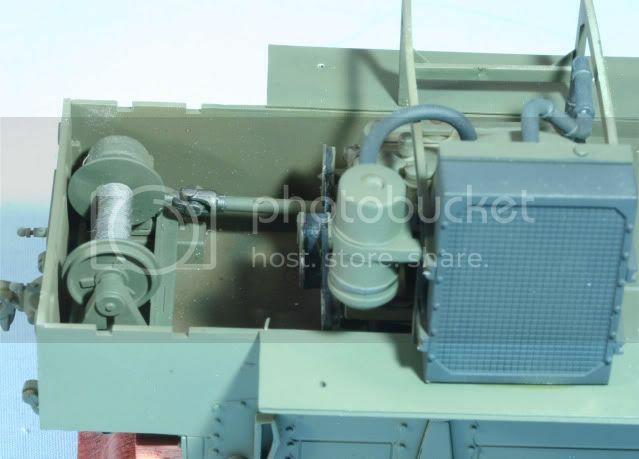 The engine compartment was weathered to prepare for the engine and winch installation with AK track wash. The same problem exists with the inside of the engine roof, covered with part position holes and big pin marks. I covered it again with .010 styrene sheet. Here it is with a roof part added. While I have the styrene out, the inside roof of the cab is a mess of pin marks and part holes. It is a bit more complicated and requires panels. Here is the roof in process. As a break from the styrene sheet puzzle, I assembled the engine. The engine on the M4 was painted OD with black hoses and steel hose clamps. After assembly and priming the main engine was painted with Poly Scale OD. The hoses and belts are painted with a rubber mix of Flat & NATO Black. The clamps and belt pulleys are painted with Alclad Steel. 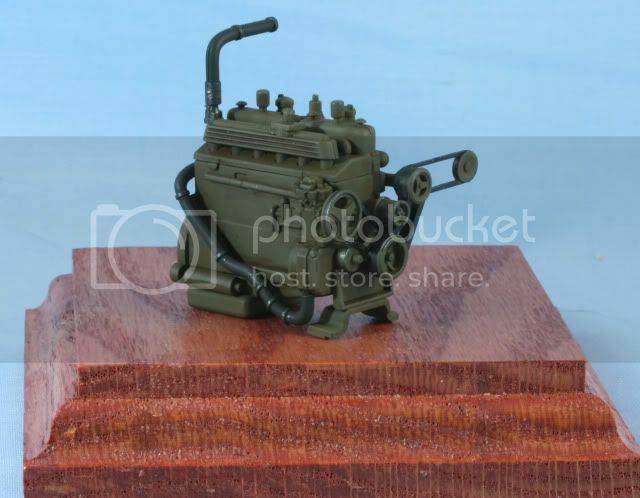 The engine was then weathered with AK Track wash.
Also in the engine compartment is the winch assembly. Again after assembly and priming I painted with Poly Scale OD. 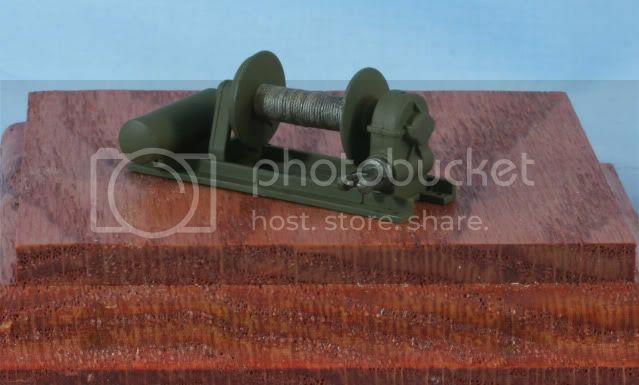 I then wound some wax coated ship builders string onto the winch spool to create the winch cable. Then I painted the cable with Alclad Steel. 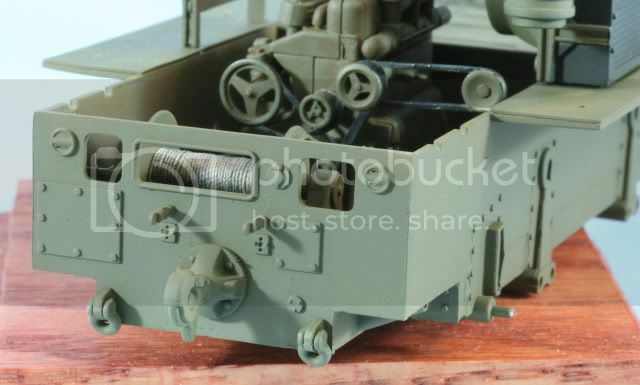 Also the PTO connection on the winch was also painted with Alclad Steel. That’s it for now. Working in 9 different directions at one time on this model. See what I get done for the next update. As always all comments are welcome. Off to a great start with this one Mike! looking forward to seeing this mission deliver on target! Looking great Mike. It will look good pulling your M115. Keep up the good work. Mike , now this is going to a wip for me to follow . I have been looking at reviews of this kit for a while . Nothing i read mentioned the pin marks in the roof . Like you i would want to correct that problem also . Thanks for this wip . Bill - Thanks for the peek...off on another adventure. Carl - The kit has nice details on one end but is a PIG on the other. It will build into a nice kit but.....the work will continue. Glad to have you peek in and hope my WIP helps when it is your turn. 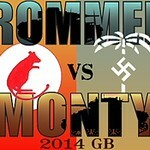 As for reviews.....when was the last review you saw where the reviewer called the kit bad!! As I said it is a good kit but has a bunch of problems....modelers need to adapt and overcome! Cliff - welcome and thanks for the peek. As I said to Carl, hopefully this helps when you are ready for yours. Bill: Did you see my remark about your winch cable? As for the reel. I am contemplating having the cable somewhat run out connected to the M115 M2 Transport dolly. I can add more cable if needed but remember, this is inside the M4 under the ammo box and only visable through the cable slot hole. I would fully agree with you on front bumper winches where the cable is rolled up. I like your concept of using the silver cable but it looks a bit clean and shiny to me. Most winch cables I have seen over the years are a dull steel color and usaully have a coating of grease on the cable to protect it from corrision and allow it to release when needed. Thanks for the peek and the thoughts. If I decide to go with the cable rolled up I will add more to the spool. Always nice to see the more obscure subjects being built up. This should be fun. YEAH BABY!!! This is one of my FAVORITE US AFV's!!! I have this one in my stash and I plan to pair- it -up with the Long Tom Cannon...someday. I even bought the Doyle book based on your recommendation. Let me grab a front row seat so I can watch this one from up-close! Mike: I recall reading comments that this one has a nicely detailed engine...which you've confirmed with that photo, but I also read it's hard to see when it's completed. Have you thought about that? Any open compartments? Eric - Thanks for the peek. you know me, I am always different. Steve - OK....the engine is nice. I have not decided if the mesh door to the engine will be open yet. I still need to "grime" up the engine. Even with it closed, the mesh is fairly open and the engine can somewhat be seen. I am planning on having the entire cab open. I will have to remake the seat cushions as the kit cushions are blaaa. Yes Now i am set to follow this one . 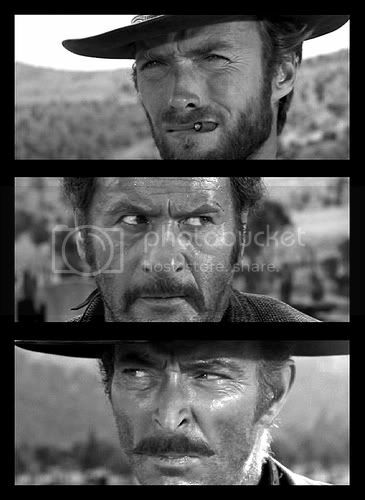 Mike: sorry -- I was confusing you with Bill Plunk. I use the silver embroidery thread but it takes paint well. When I shoot the model w/primer, it gets covered. I follow up w/gun metal paint and oily gunk too. The cable being extended makes lots of sense then! You said in one of your early posts this has 'got you going in 9 different directions ' ..... so what else is new with a multi talented guy like you ? ..... looks to me like all 9 are going the right way ! No problem Roy....just remember, I'm the ugly one!! And drinking ! Popcorn makes me thirst quickly so gonna have plenty of handy. Of course please count me in too. Looking great... finally something other than a cannon from Redleg12 factory. I take it as a compliment to be confused with Mike...although his admission that he's "the ugly one" let's me off the hook! Tread - Thanks for the peek.....I am always humble by your comments. You know the old saying, "so many models, so little time"
Deafpanzer - Always welcome....now we have to remember the main purpose of the M4 HST.....Artillery!!. Perfect for towing my big 8 inch.....ok I won't go there. Glad to have you along. The picture order can be changed to protect the innocent!! Shell, you just like corn ! Happy Memorial Day Weekend to everyone. First while you are enjoying that hot dog, remember the 7% of the population who have worn the uniform, and especially those who made the supreme sacrifice. Say thank you to a vet! In another direction are the road wheels and assemblies. The drive is a two-part assembly, the rear idler wheel is 3 parts for the wheel and then another 3 parts for the assembly. The boogies are a three-part assembly plus the two wheels. The upper idler rollers are mounted on there axels. After cleaning up and priming all the parts the road wheels were painted with a tire black mix of 50/50% Flat & NATO black. The idler and upper idlers were painted with Alclad Steel. After drying the rims and mounting parts were painted with Poly Scale OD. Once dry, I completed final assembly of the road wheel assemblies. I mounted the internal divider walls and on the right wall is also mounted the crane locking bracket from the Eduard PE set. I then worked on the outside sidewalls removing the styrene blobs for the tie downs and the vent grill. I applied the Eduard vent grills to the outside walls. 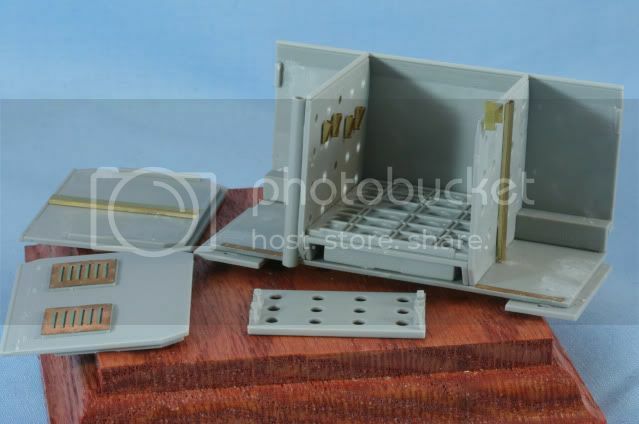 The Eduard set gives you parts so you can cut the holes through the end walls for the vents. Even though I will have the ammo box partially open when finished, I will have powder cans in those compartments so I took the easy way out and just mounted the grilles since the holes would not be visible. Also, on the inside wall of the end panels is a PE panel divider. Mike , thats some good looking engine detail and the winch cable looks perfect . Everything progressing well and looks cool... nice details with the winch and PTO and all. Is the Vallejo OD primer just a primer or can it be used as a topcoat also ?